2012 was the year in which Littoral lost its status as a Regularly Funded Organisation of Arts Council North West. 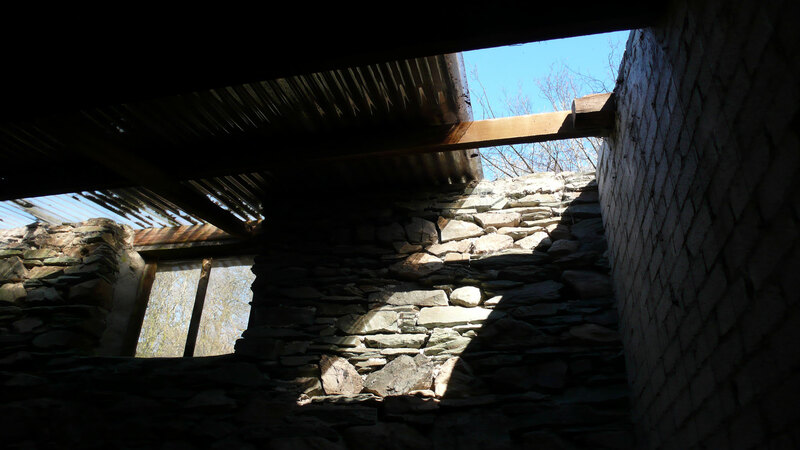 We were however awarded a major grant from the Cumbria Fells & Dales LEADER+/RDPE programme for renovation of the Merz Barn and creation of the Merz Platz. This work continued over to the end of June 2013. Behind the Merz Barn: work begins. November 2012. In the absence of outside funding for events, and partly also because the capital programme necessitated almost continuous residence at Cylinders from November 2012 on, the Littoral Directors improvised a new approach to the site, keeping it open whenever possible, and waiting to see what the winds blew in in the way of visitors. 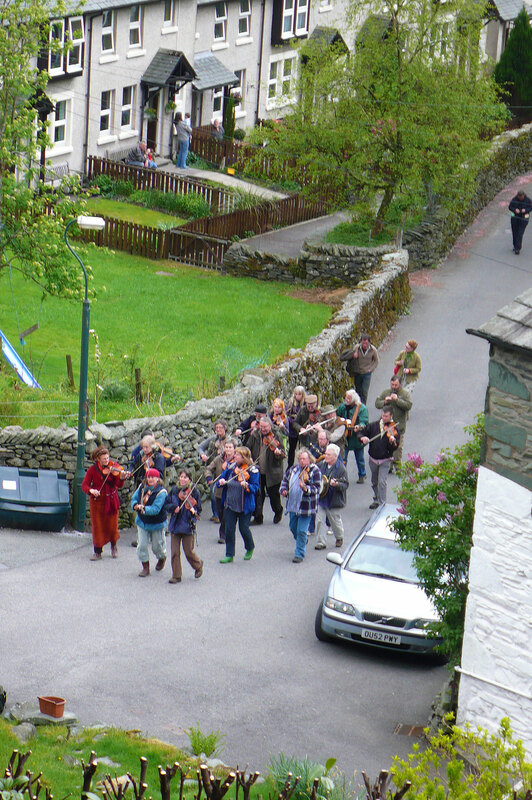 The Cumbrian Fiddlers processing through Chapel Stile before entering the Holy Trinity churchyard to play at William Irwin’s graveside, May 6 2012. Sunday afternoon at Cylinders: the Lakeland Fiddlers perform. 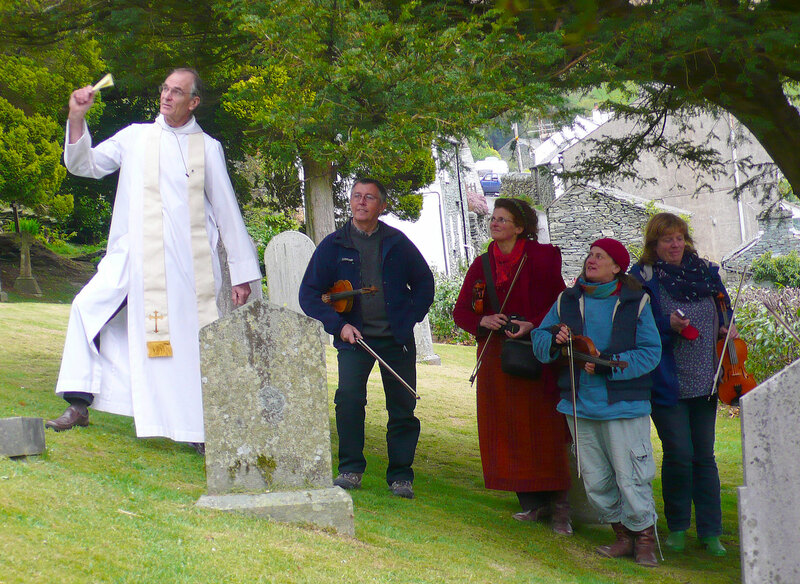 Vicar George Wrigley blessing the Lakeland Fiddlers. 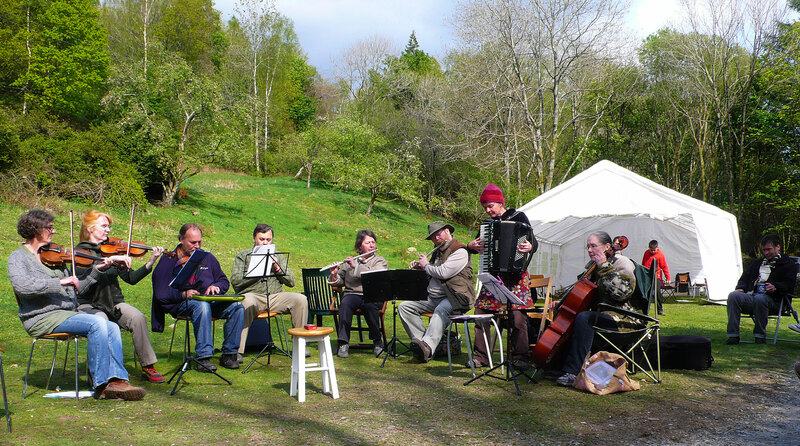 We did of course run some structured events – the Cumbrian Fiddlers’ Festival event in May, and the Summer and Autumn schools in July and October. The bulk of the programme however consisted of the many short-term visits by artists and students. Once Tate Britain had announced the Kurt Schwitters and Britain exhibition, which ran from the end of January 2013 to the beginning of May, the number of artists and related professionals finding the gates open and dropping in to see the Merz Barn increased dramatically, and whenever convenient they were invited in to have a cup of tea, or share lunch or dinner. Gradually we came to realise that this was possibly one of the best ways Littoral could celebrate and continue the legacy left by Schwitters, spreading his fame and acknowledging the role of refugees in Britain and their need for shelter and sustenance. And we of course enjoy the process, and feel it a privilege to have such a lovely site to share, and also to discover at first hand how other artists and young people are coping with the economic and other problems of this troubled and overcrowded period in the country’s history. What follow are some images of events as they unfolded. Video made by Cheryl at Cylinders: ‘Plague’. at The Bell House, Brooklyn, NY. 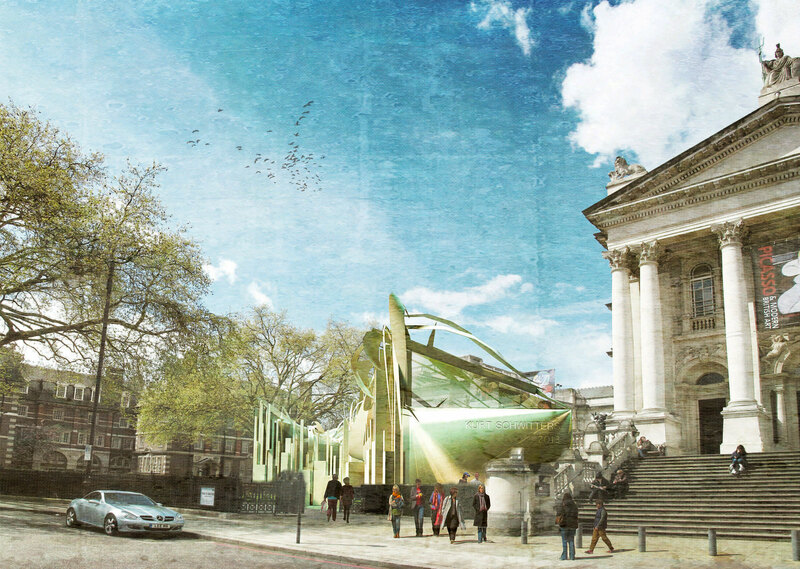 Architect Natasha Reid: Proposal for a Merz Pavilion outside Tate Britain to accompany the ‘Schwitters in England’ Exhibition. Natasha Reid: Proposal for a Merz Pavilion outside Tate Britain to accompany the 2013 ‘Kurt Schwitters in Britain’ Exhibition. 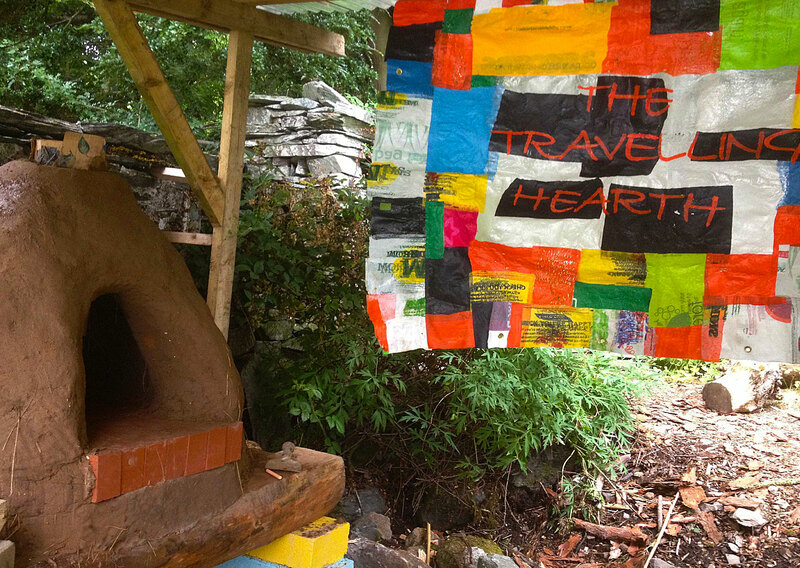 See Natasha Reid’s 2012 KS Summer School website: Art, Architecture and the Narratives of Cultural Displacement: An Architectural Residency at the Merz Barn as part of the Kurt Schwitters DIY Summer School. 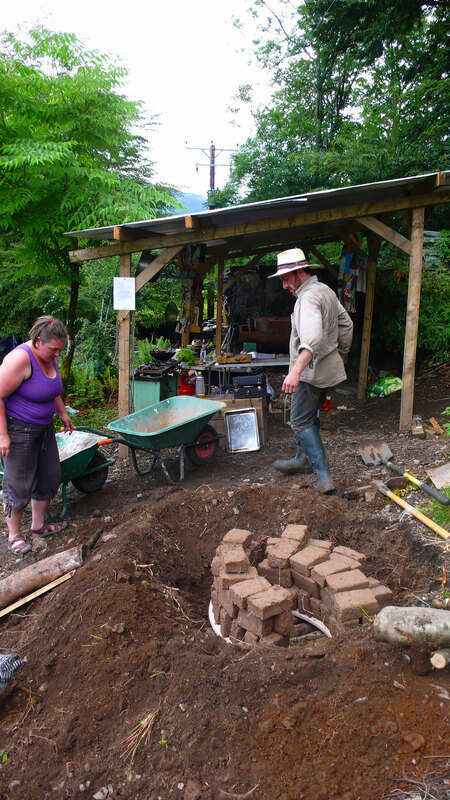 Christine Dixon and Miki Zed of ‘The Travelling Hearth organising the outdoor cooking for the 2012 Summer School. Sculptor Bruce Ingram moving his ‘Merz Pillar’ to the Merz Barn. (The work had to be reduced a little to accommodate it!). KS Summer School, July 16-24 2012. The 2012 Summer School was largely organised by a group of artists and students who had attended earlier events at Cylinders. 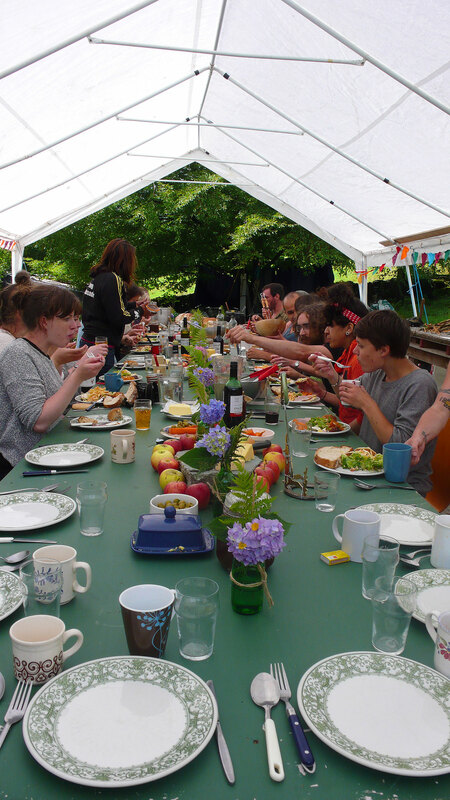 Littoral provided the infrastructure, and we were able to rent the Weirside bunk barn to accommodate the attendees, who each paid a small sum to cover the costs of the al fresco catering which was superbly organised by Christine Dixon and Miki Zed. Littoral funded and organised a series of workshops for the Summer School, beginning with the Curating Merz Seminar on July 17th which focused on the possibility of curating ancillary events to accompany the Tate Britain exhibition in early 2013. The speakers included Jenny Powell from Tate, Dr Tordis Berstrand (UCL), Nico de Oliviera and Nina Oxley (SEA), Rob Airey (Hatton Gallery Newcastle), Guy Moreton, Dave Kirkwood, Graham Martin, Bruce Ingram, and Natasha Reid. Art and craft workshops were led by artist Jill Rock, sculptor Bruce Ingram, who created a post Schwitterian Merzsäule, and textile artist Elizabeth Shorrock. 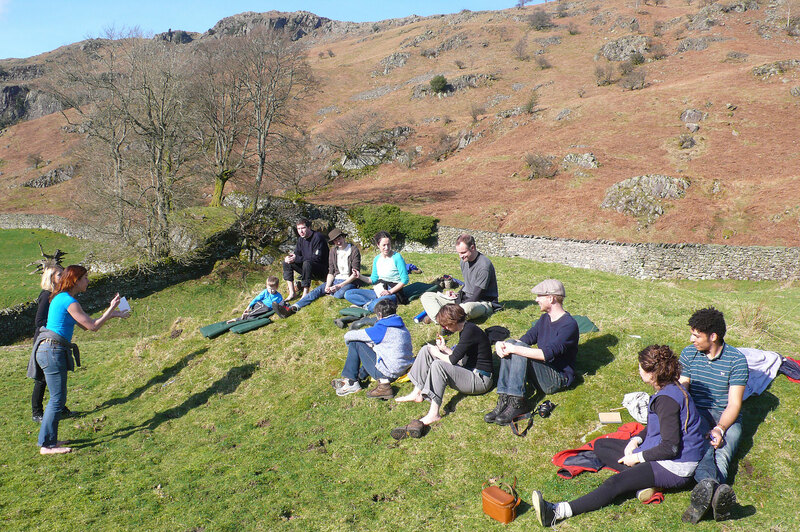 The 2012 Cumbria Scything workshop was held on July 21st and 22nd, a smaller affair than last year’s, but luckily with perfect summer weather. Tom Branton was the instructor. The barbecue on the evening of the 21st was attended by many old friends, and, unexpectedly when their anticipated gig fell through, by a group of the Cumbrian Fiddlers including Carolyn Francis and Steve Grundy. A truly wonderful evening this, culminating in a reading of the names of the artists proscribed by the Nazi authorities in 1937, and a ceremonial chalking of their names on the end wall of the Merz Barn. The Lakeland Fiddlers playing to attendees at the 2012 Summer School. Artist Jill Rock with Ian Hunter at the first memorial celebration of the artists whose works were featured in the 1937 Exhibition of Degenerate Art in Munich. Steam-Bending wood workshop with artist Charlie Whinnie. Thomas Branton leads a wood crafts workshop. Visit by artists Guy Moreton and Alec Finlay to Cylinders, 17.08.12. On this, poet Alec Finlay’s first visit to Cylinders, he left a wee poem hanging from a branch of the apple tree for the roe deer to find. Later in the year he was commissioned by Film & Video Umbrella to make a number of artworks for Merzbank, 2013, to be exhibited during the run of the Tate Britain Schwitters in England exhibition. Finlaychose the theme of bees, and had a hive made specially for Cylinders, in honour of Harry Pierce’s original beehives there. Beehive Poem designed for Cylinders by Alec Finlay. Alec Finlay and Guy Moreton at Cylinders. 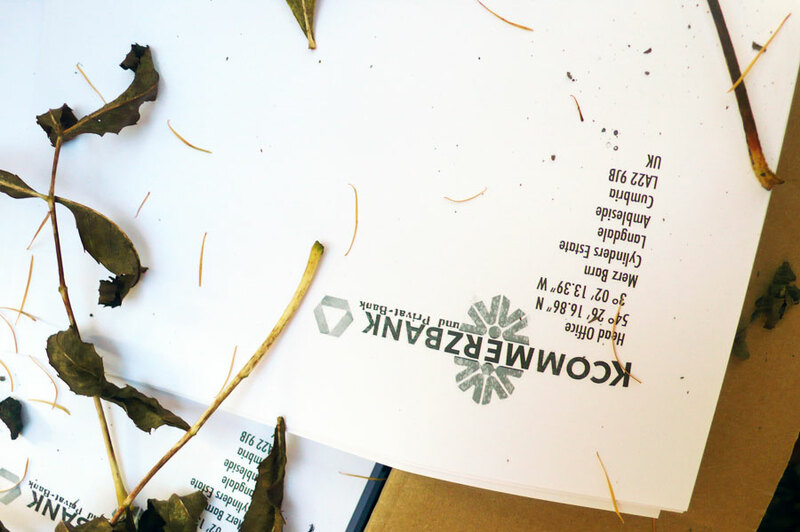 ‘Kcommerz’ letterhead designed by artist Adam Chodzko. Adam Chodzo at Cylinders Adam was invited by Grizedale Arts to creat an installation for exhibition at the 2013 Schwitters in England show in Tate Britain. 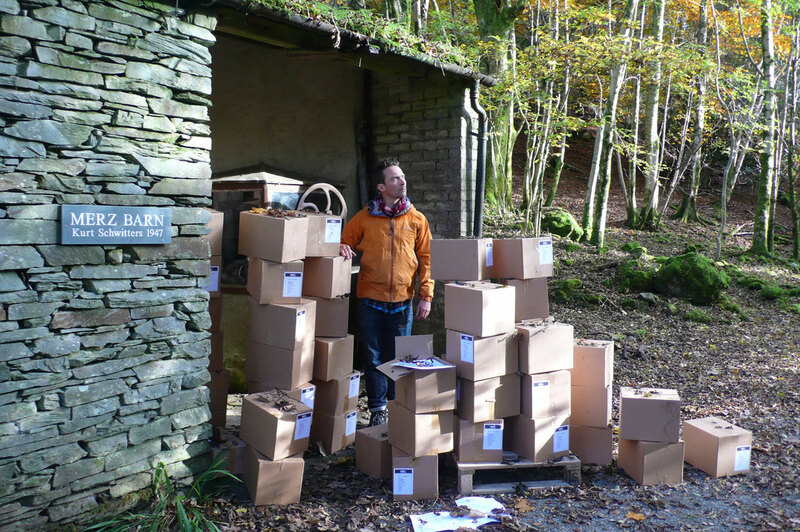 A part of Adam’s work involved creating a Schwitters-style letterhead, and he stored the printer-fresh pages in the Merz Barn for several weeks to ‘mature’ them. KS Autumn School and ‘Off the Grid’ Seminar The 2012 Autumn School was distinguished by a guest lecture on October 19th by Ute Meta Bauer, Dean of Fine Arts at the R.C.A. This was given in the atmospheric conditions of the white marquee, lit mainly from outside by a bonfire around which the audience huddled, invisible to any photographers present. After the lecture there was the annual ‘Reading of the Names’ of the artists proscribed by Nazi Germany, which took place in candlelight the new Merz Platz (or plaza) after a blessing by the Rev. George Wrigley of Holy Trinity Church, Chapel Stile. Ute Meta Bauer with 3 students from the RCA Critical Writing course being interviewed at the Salutation Inn, Ambleside, 19th October, 2012. It was in this hotel that the Royal College of Art was billeted when evacuated from London during WWII. 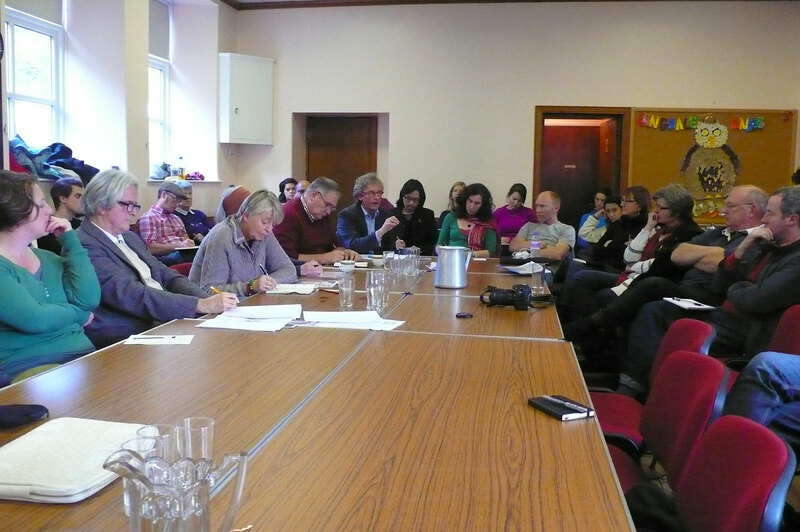 ‘Off the Grid’ Seminar, Chapel Stile Village Hall. Ute Meta Bauer giving the keynote lecture at the KS12 Autumn School. .2013: Apart from the remainder of the RDPE/LEADER+ funding for restoration of the Merz Barn and construction of the Plaza, Littoral had no project income for the year. We therefore concentrated on completing the site works, creating additional car-parking facilities, and welcoming artists and art students wishing to visit the site, enjoy its facilities, and work here. The Tate Britain ‘Kurt Schwitters in England’ exhibition, which ran from the end of January to May 2013, continued to bring a welcome increase of interest in both Schwitters and the Merz Barn and the Hatton Gallery. Visitor numbers increased steadily during the year, and many people wrote of their experience in the Visitors Book. The Exhibition also brought media publicity and visits by journalists to Cylinders, all of it beneficial, as well as a visit by the Tate Patrons. Since the contemporary artists featured at Tate, Adam Chodzko and Laure Provoust, had also studied and photographed the Merz Barn site, it was a pleasure for us when Laure became the recipient of the 2013 Turner Prize, cementing our good relations with Grizedale Arts. .Installing drainage in the slope above the Merz Barn proved a much bigger job than had been anticipated. It seemed a long hard winter indeed with the ground churned up, heavy vehicles moving to and fro over the site, and the new plaza taking an age to complete as the weather worsened, snow fell, and work was interrupted for days until it had all melted, since concrete will not set in freezing conditions. The Snow Sculpture formed as the snow began to melt and slide off the Merz Barn roof. The old Merz Barn roof being removed. 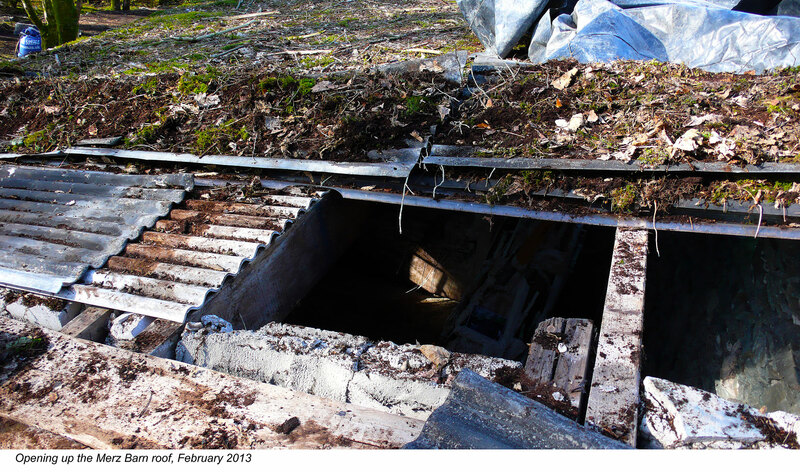 There was also the replacement of the old roof of the Merz Barn to be considered. In Schwitters’ day this had been made of corrugated iron but at some point, presumably when the art installation was removed, some of this had been replaced by corrugated translucent sheeting, whilst over the Cake Room was corrugated asbestos. Although plant life had colonised the roof it had done so patchily, and the skylight was missing. Schwitters had insisted on installing this because it focused the light down from the right hand corner, and was essential to his artwork, the whole composition leading the eye upwards to the skies. Removing the old roof however, especially since the whole Merz Barn area was in a condition reminiscent (to Celia) of the worst days of the WWII bombings, and the weather was bleak in the extreme, was traumatic. The work was going on too long and it seemed that deadlines might be missed, the men were cold, wet, dirty, miserable, and everyone had long forgotten what the aim of all this devastation had been. Which is why the photograph of the finished Plaza, taken two months later with the sun actually shining, provides us with such pleasure. The story does have a happy ending, and when the circular seating is peopled by groups of children or adults, the sun is shining, and Jill Rock’s ‘Root’ sculpture provides, as is now the case, a miniature Japanese garden of mosses and weedlings, it is really beautiful. Carpenter Andrew Rodway and Ian Hunter with their Lake Windermere Monster. 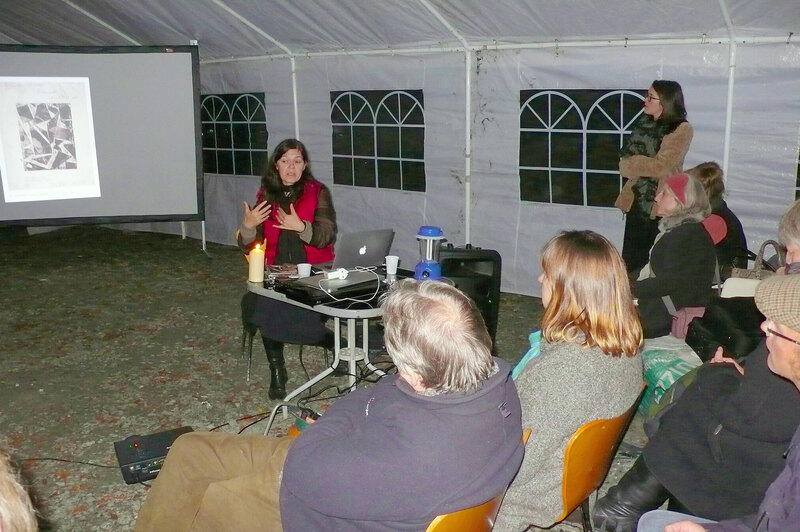 At the beginning of 2013 Littoral was invited by Paul Rose, the impresario organising the event, to store the mountain of débris of various kinds that had been dredged from Lake Windermere as part of the ‘Great Litter Dive’. In a weak moment we accepted, and agreed to try to convert the resulting heaps of abandoned car tyres, wave-worn bottles, and odd bits of boats, into a decorative play sculpture, working with the children from Langdale School and anyone else who was prepared to help. Ian Hunter and our local chippy Andrew Rodway created a unifying backdrop for the sculpture in the shape of Lake Windermere which, laid on its side, happened to look rather like a dragon. They painted it nursery-sea blue and invited the children on site to choose objects to add to the scene. The children also drew and painted fish and other marine shapes onto plywood, which Andrew then fret-cut out for them to stick onto the back-drop. The installation was completed by artist Sam McCormack, who spent hours arranging the litter around the Monster, turning it into a narrative whereby the lake was gradually transformed from filthy and litter-laden into its original pristine purity. A couple of months later Paul Rose returned to have the project filmed for publicity purposes, occasioning opportunities for some manic sea-creaturing behaviour. D.I.Y. Summer School, July 19 to August 4, 2013. Due to financial constrictions, the 2013 Summer School was experimentally billed as D.I.Y. Organisation was handed over to the participants themselves, led by Charlotte Turton and Beth Collar, who had both attended several events at Cylinders before. They charged a fee for artists to attend, and the idea was to pay the organisers for their time, and Christine Dixon and Miki Zed of The Travelling Hearth for the catering. Washing-up, cleaning, and other chores were shared between everyone, and accommodation was in the TOC H bunk barn at Chapel Stile, which has hot showers, a kitchen, and facilities for drying wet clothes – as well as the ping-pong table that is its chief claim to fame. 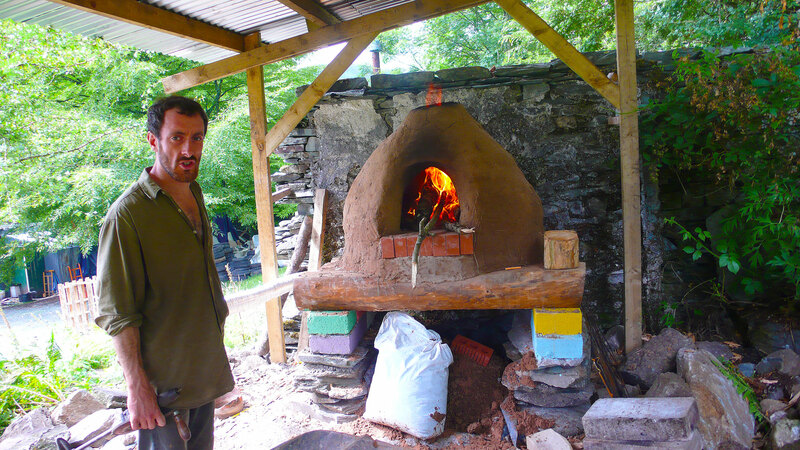 One permanent and very welcome outcome from the Summer School was the clay oven that Tom Branton created with Miki Zed and the Summer School participants. Luckily Tom is a geologist, alongside his many other talents. Since there is no clay at Cylinders a substitute had to be found, and he informed us that the purest form of clay is actually cat litter! A trip to Aldi was arranged, and their entire stock bought up, laboriously mixed with sand and straw and formed into bricks. After drying off in the sun, which was miraculously constant during this Summer School, the bricks were built into a beehive shape and subjected to a careful firing process. After the Summer School was over the oven lived on. Many wonderful loaves and pizzas have been baked in it and it shows no sign of deteriorating. It hasn’t so far been taken up as a wildlife habitat either although it looks an inviting sort of space to colonise. The shelter over it however, also built by Tom, has been colonised twice over, the first time by the hens, whose new house was cobbled together under the corrugated iron roof, and secondly by artists, who quickly began to see the blank boards of this henhouse as the setting for installations of their own.. 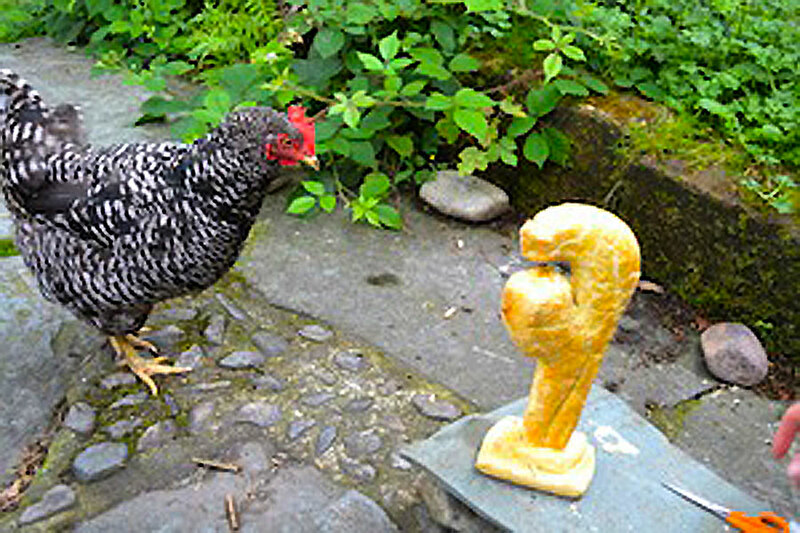 The juxtaposition of cookery, art, and hens was taken a step further during a residency by Manchester artist Jackie Haynes in 2014. Jackie first showed some of her pastry sculptures during the ‘Constructing Landscapes’ Exhibition selected by M.A. students on the MMU ‘Curating’ course, shown in the Shippon Gallery, July 6 to 13, 2014. Jackie’s exhibits centred on her ‘Stake Pie’ creation, a real pastry pie with a rusty stake piercing its inedible innards. This was set in the gallery window, and the chickens spent the two weeks peering hopefully at it through the glass, but were dissuaded from entering the gallery. Cylinders hen taking an interest in Art. When Jackie returned the following January for the ‘Resisting Absence’, residence by Manchester artists at Cylinders she had begun to take an interest in Schwitters, and visited his grave in St. Mary’s churchyard, Ambleside. Here she learnt that that grave had been empty since Schwitters’ son Ernst had had the body exhumed and removed to Hanover, where a fine new grave was dug for it surmounted by a blown up version in white marble of a small sculpture his father had made and titled ‘Die Herbstzeitlose’ (autumn crocus, in German ‘the out-of-time autumn flower‘). Jackie decided to bake a small replica of the Hanover sculpture in pastry to replace on the Ambleside grave. This proved popular with the avian audience! Littoral Trustee writer Mel Gooding and his wife Rhiannon by Schwitters’ grave in Ambleside. 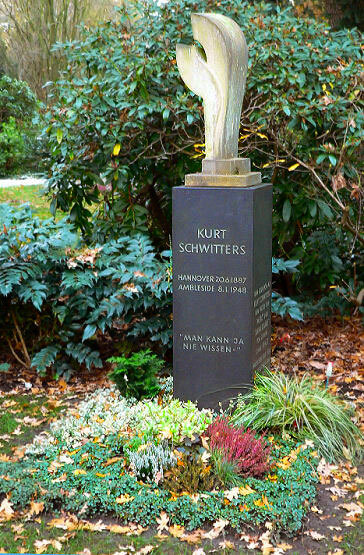 Schwitters’ monument in the Hanover cemetery. Re-enactment of the photo taken at Barnes, Photo Carina Gosselé. The 2013 Autumn School, KS13, rook place from October 25th to 27th. The Guest lecture was by Dave Kirkwood of Dave Kirkwood Studios, on the topic of ‘Schwitters and Typography’. There was a jolly barbecue the night before, with the Lakeland Fiddlers in full strength, and a magnificent turn-out, including no fewer than 19 from UWE, 9 from Liverpool University (The Institute for the Art and Practice of Dissent at Home),, a strong contingent from Bristol and at least two babes in arms. The bread oven was put to good use for a pizza bake-in, and the Reading of the Names was held as usual. KS13: Writing the names of the artists proscribed by the Nazis in the 1937 Munich Exhibition on the Merz Barn wall.